Have you ever driven in Southern California? The Main Street, El Camino Rael runs from San Francisco to San Diego. 600.2 miles of a hellish nightmare. Six lanes, three in each direction. Two of these lanes appear and disappear without warning. u-turns are encouraged. Imagine, you are stopped at a red light, you can see the next red light a city block away, between you and that light is a short strip of road with a speed limit of 55mph. If you are not doing 55 by the time you cross the intersection you are currently sitting at, you become a moving hazard! You know your right turn is coming up but not sure exactly where so you move into the right lane, You are moving at 60+ mph cars are all around you and your lane disappears. Whatever you do don’t use a turn signal. Turn signals tell the other drivers to bunch up and not let you merge. Luckily its okay if you fly past the street you want because now you get to play frogger and cross over to the left lane before the next intersection so you can ‘bang-a-uey’ into the three lanes of traffic coming at you and start the process all over again. There is of course one street far worse than El Camino Rael. The Freeway. Me: “Okay Denyce, now where?” I ask, the mood being a little tense. Finally I get turned around. I know I should drop the issue but I couldn’t. I start to worry maybe I’m the one with Dementia. Always Trust Garmi, Part One. I have a lousy sense of direction. When I interviewed for the job I am currently in I was informed that we cover not only State College but Lewistown, Huntingdon, Lockhaven, Lykens, Tyrone and we help out our sister warehouse, (who my supervisor also supervises) Williamsport. I was asked if I had issues if asked to travel to any of these destinations. I was perfectly honest about it and told them that I had no issues about traveling to any of the locations. Lykens, being the farthest out is only two hours away. So really it’s no big deal. “Nope, no problem” I responded. However I immediately started thinking about the time I showed up to work at the bank and they asked me to help out in the Avis office. I wasn’t sure what a bank teller was going to do at a car rental agency, but what the heck. Then I remembered that there is a place called Avis Pa. I had been there once before and my wife was driving. I was told just go towards the mall and keep left, it should take an hour. If you look at Google, to get from the State College branch of the bank to the Avis branch you would see it is a basically a straight line. Two hours later I found myself at the Jersey Shore! I had no idea when I crossed into Jersey, I didn’t even know Jersey was so close! What I did know is that something went desperatly wrong. It turns out that just as there is no Port in Port Matilda the Jersey Shore is not actually in Jersey! Oh I’m sure there is a shore in Jersey but it is not this Jersey Shore which is probably a good thing because as much as I didn’t want to be lost, I really didn’t want to be lost in Jersey, (new or old) I didn’t have a GPS, I didn’t even have a cell phone, I was in the wilds of Pennsylvania and lost, eventually I had to (gasp!) ask a man at a local business how to get to Avis. The man was very nice and pretended to understand how I missed the exit. After all, it is really hard to see that large glaring Avis exit sign. I think he saw my eyes gloss over as he gave me directions which were basically, ‘drive down this street and make a right’ And this very nice man got in his truck, yes a beat up red truck and had me follow him to the bank. In Montreal I never got lost. Not that my sense of geography or direction was any better, I just didn’t drive. I got from point to point by walking, transit, or bike. 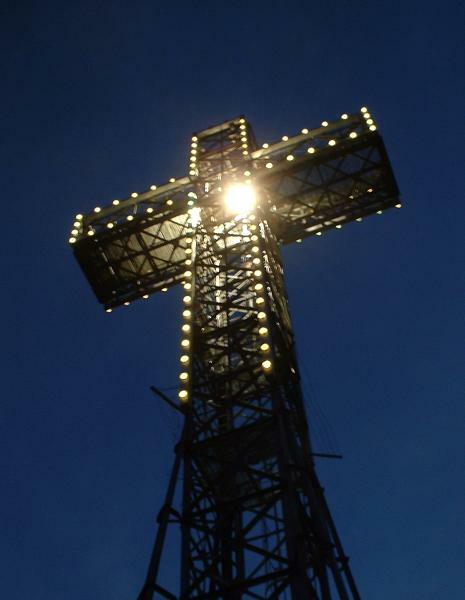 And if I did get lost all I had to do was find the ﻿giant ﻿cross﻿ on top of the mountain and head for cross. Once at the top of the mountain I knew where home was. In Vancouver I never had to travel. Everything I needed was in a four block radius. And if I wanted to go downtown I took the skytrain which only went in two directions. Even I could navigate that. My wife and I were hesitant about a GPS. Our only experience with one was through my father. My folks came to visit, my father had a Tom-Tom and loved it. We wanted to go to a restaurant in Altoona called Don Pablo’s. My father punched it into Tom, we explained it wasn’t necessary as the only reason we ever go to Altoona is to go to this particular restaurant and it is easy to get too, it is right off the exit. But my father insisted. I watched Tom-Tom as we drove and I too was soon in love with the machine. But Tom got it wrong. It had my father get off the highway an exit too early. We told him no, but he was going to listen to his buddy Tom. Fine, it was just going to take a little longer. Then Tom told my father to turn Right. This was totally the wrong directions. Images of a cab ride of long ago came to mind. We convinced my father to disobey Tom. Lucky my wife has a great sense of direction because now I was as lost as Tom. My father refused to admit Tom was wrong. He informed us that there must be another Don Pablo’s. Why yes, yes there is as Don Pablo’s is actually a chain. The next closest one to us is in Virginia! We got to the restaurant and my father still refused to admit defeat, (he is loyal that way) and told the waiter what happened and if there was another Don Pablo’s in the area. Yes, yes there is if you consider Virginia part of the ‘area’. the waiter understanding my father’s predicament did offer a way out. He mentioned that there is a Mexican community on the other side of town and perhaps Tom-Tom new a Don Pablo that lived over in that direction. …no turn signal no turn. “Recalculating, make a u-turn in 50 feet”…Father continues to go straight. Eventually and with enough of us pestering him he makes the U-turn and Tom leads us safely to the restaurant. I was offered, and accepted the job two days after the initial interview. My date of hire was a few days before my birthday. We also had made plans to drive down to California to visit my father-in-law. All things considered it seemed a great time to purchase a GPS. Help Sequoia secure a spot on an SPCA calendar!